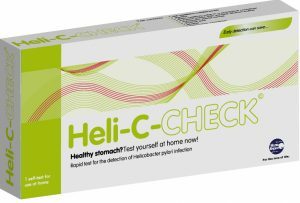 Heli-C-CHECK is a rapid test for use at home to detect the presence of Helicobacter pylori antibodies in whole blood.Heli-C-CHECK is intended as an aid in the diagnosis of Helicobacter pylori infection. The diagnosis must be confirmed by the physician. The most common cause of painful inflammation of the stomach lining with nausea and abdominal discomfort is a bacterium called Helicobacter pylori. Chronic inflammation in the stomach (gastritis) or ulcer may have further consequences. Helicobacter pylori bacteria can contribute to the development of diseases, such as ulcers in the stomach and lymphoma progress (a type of cancer).